Hey there rodmakers – It’s mid-June of 2016 and Natural Cork Hex-A-Grips!™ are now in stock. We’ve still got some of the amalgamated Hex-A-Grip!™, too. When we were in the early stages of creating the Arcane Hexagate™ hexagonal agate stripping guides, we were also bantering back and forth about other components that we could put a hex on. A Grip! Sure, why not. Ought to be easy enough. I sketched. Drake worked his CAD magic. He created a hexagonal cork grip that could be oriented in either direction, depending on the rodmaker’s taste and the other components he or she would be matching up with the grip. We named Drake’s design the Hexagrip™ (now Hex-A-Grip!™ on the marketing materials, but still Hexagrip™ in the text in part because I can type that faster) and we were off and running. We shipped the drawings over to Portugal. We waited, almost patiently. And that’s when the realities of milling cork, versus turning cork, hit us smack in the middle of our “easy” project’s forehead. These grips could not be produced by the factory turning our other grips. It took over six months of shopping our original hexagonal grip design around the Iberian Peninsula before my friend in Portugal found a factory with equipment that could produce the grips to our specs. So, early in 2016 we received a good news/bad news note. The grips could proceed, but not with natural cork rings – only with amalgamated cork. After a bit of hemming and hawing, we bit that particular bullet and went ahead with a short run, sample order. After sharing some of the new grips with a few of the folks involved in the project’s conception, there are less than 100 available. They are Hexagrips™, matched to Drake’s design. The design is exciting and surprisingly comfortable – that’s the good news. They are made of cork, but it is amalgamated cork, so the color is particularly uniform and, frankly, a bit bland; that’s the ‘bad’ news. But they’re hexagonal – and that’s really cool! This is as good a place as any to discuss the feel of an angular grip. For indexing your thumb, there’s nothing quite like a flat. Bam! You know where you’ve got to grasp this grip. Your fingers curl around the corners and all four of your fingertips will snug around and latch onto other flats. The cork is soft – which is why we all love it for grips – and the angles aren’t hard, so there’s nothing unpleasant about the grip. Different? Sure. But it’s a bit of variety that we think you’ll appreciate every now and then. The spice of life. Back to the story. Just about the time these grips were going to ship, I received another note: now we can do them in natural cork. Before long, two samples of Hexagrips™ in natural cork arrived with batch of Hexagrips™ formed from amalgamated cork. They are cool all the way around, in both design and materials. We have some pictures of these posted, too. Please bear in mind, we just initiated the production run on the Hexagrips™ in natural cork, so you’ll have to wait until later this year to buy one of them. In the meantime, you can sample the concept with an amalgamated Hexagrip™. And as per the note at the top of this page, the first full batch of natural ring Hex-A-Grips!™ are now in stock. Exciting stuff! These grips are considerably more expensive to manufacture than normal, turned cork grips. This expense is fully reflected in the retail price of the Hexagrips™ now that they’re offered in natural cork. We’ve got to earn our margins, or we won’t stay in business. You know how that goes. However, the little batch we produced with amalgamated cork, will be offered below what our suggested retail tag should be, for the simple reason that we want you all to sample the concept. 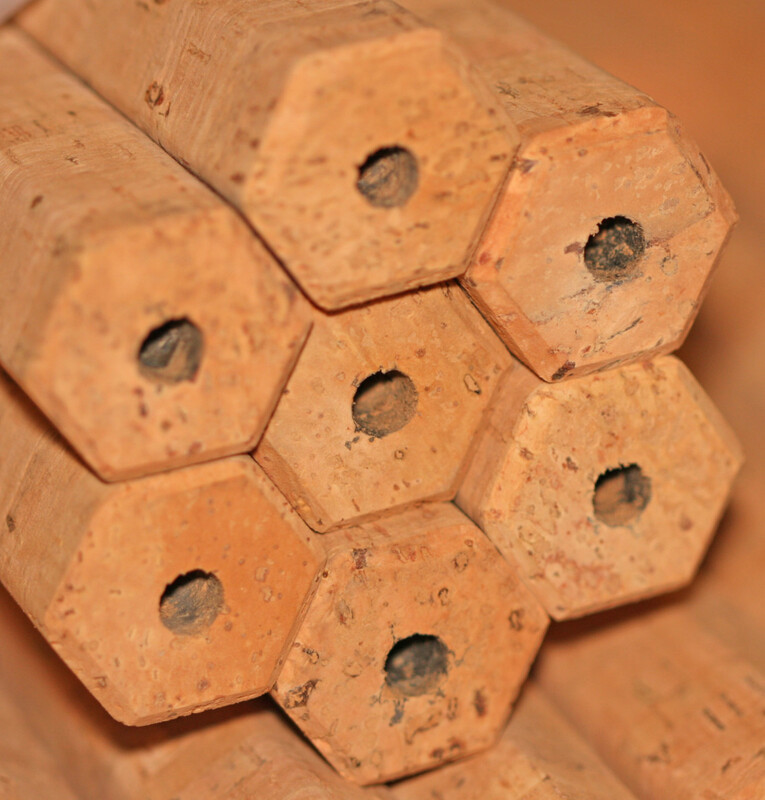 If you like the concept, please come back and grab a Hexagrip™ in natural cork. Usage Note: In the photo gallery you’ll see images that show us “crisping the flats.” You can certainly slap these grips on a rod as you receive them. However, the milling process used to shape these faceted grips leaves a slightly rougher texture than I’d prefer – artifact of process. The solution is easy and momentary. You need to sand each flat a specific, counted, number of times. By counting your passes, you keep the grip centered around the bore. I could pay the factory to hand sand each facet, but then the price would skyrocket. Thankfully it’s easy for a rodmaker to clean up the grips with a few passes on sandpaper, 6-10 (again, counted – for uniformity) passes on each flat of the hex…150 grit (ten passes), 180 grit (eight passes), 220 grit (six), 400 grit (six), 600 grit (six). In just minutes, the hex is crisp and clean. Because these are amalgamated cork (similar to burl, but with a finer grain to the cork particles), I strongly suggest applying a sealer to these grips – Cork Seal by U-40 or Tru-Oil – after you sand.